As a print and pattern lover I adore vibrant Japanese kimono prints. It’s fabulous when they can be re-purposed. I love the way the designers above modernized these stunning prints by using them to make shoes, a clutch, and necklace. yes indeed Iva, I love them so much. I would wear them with almost anything. A black dress and these shoes would be so chic. 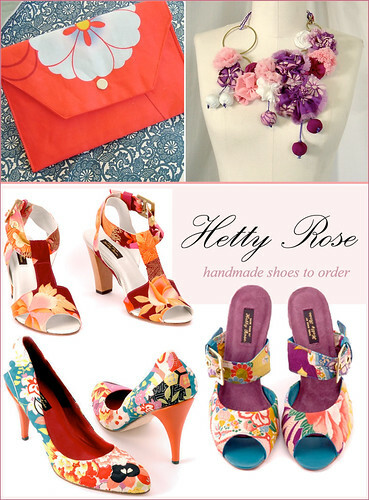 I have been wanting a pair of Hetty Rose shoes forever–thanks for reminding me! she’s amazing!!!! I love them. But your Miu Miu shoes are too cute! OMG, I loooooove these shoes!!!! They are handmade?!?! Amazing!! I know Hijiri….It’s hard to believe such beautiful craftsmanship exists today. I covet them so much!